This project addresses the ecological, evolutionary and societal consequences of increased grazing pressures and rising temperatures in the Lake Hövsgöl region of Mongolia where the effects of warming are already being felt. The education and research missions involve a full and equal collaboration of ecologists, evolutionists and anthropologists from the National University of Mongolia (NUM), Mongolian University of Science and Technology (MUST), the Mongolian Academy of Sciences in Ulaanbaatar (MAS), the Academy of Natural Sciences of Philadelphia (ANSP), and the University of Pennsylvania (Penn). Within this framework, we are providing training for Mongolians and U.S. citizens and developing an infrastructure that will enable long-term scientific exchanges to extend beyond the duration of the grant. We have four new research projects related to understanding the ecological consequences of increased grazing and climate change. Additionally, we are continuing critical monitoring of climate, permafrost, hydrological cycles, and movements of nomad families and their livestock. The larch forests and steppe grasslands around Lake Hövsgöl are under two strong ecological pressures: (1) the increase in overgrazing as local culture changes from a nomadic to a more sedentary lifestyle, and (2) the increases in mean temperature and length of growing season, which are driven by the climate change trends in high latitude locations such as Mongolia. Mongolia lies on a high plateau between Eastern and Central Asia with a north to south transition from the taiga of Siberia through semi-arid steppe to the Gobi desert, with ecotonal transitions between each zone. Much of the communal pastoral areas are in the boundary between steppe and forest ecosystems, and understanding climate-induced changes is especially critical because Northern Mongolia has already warmed almost 2°C over the last 40 years. Nationwide, nomads make up 30% of the population, moving with their mixed herds of sheep, goats, horses, cows or yaks to seasonal communal grazing lands, and overuse by nomadic grazers has led to major changes in plant dominance and reductions in standing plant biomass. Most of the research and educational programs are being conducted at the International Long-Term Ecological Research (ILTER) site at Lake Hövsgöl. 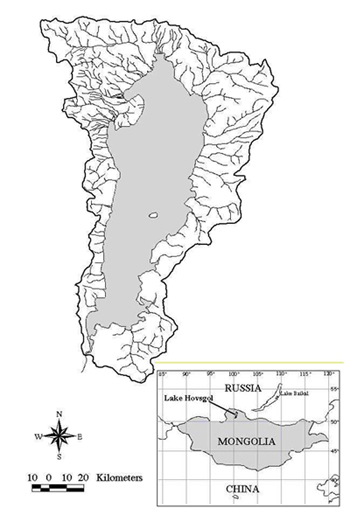 Lake Hövsgöl, one of the 20 largest lakes in the world, drains into Lake Baikal and lies at 50°N and at 5000 ft. elevation. In 1997, the Government of Mongolia approved the formation of the Mongolian ILTER site. The site consists of six parallel stream valleys entering the lake from the east with heavy to moderate grazing in the four northern valleys and low to no grazing in two southern valleys. The surrounding watersheds are a mixture of steppe grasslands and taiga forest (primarily larch, Larix sibirica). Ridge tops and north-facing mountain slopes are forested, and valley bottoms and south-facing slopes are steppe and generally heavily grazed. Beneath the forest on north-facing slopes is continuous permafrost. The steppe and forest ecosystems differ greatly in their primary productivity and species diversity, and these differences enable a tractable approach to address climate-induced changes in ecotone boundaries. From 2001-2005, a study of the combined impacts of nomadic pastoralism and climate change in the Hövsgöl watershed was funded by the Global Environment Facility (GEF) and implemented by the World Bank. GEF and other data are available to our project, including regional climate data for the past 70 years, almost 400 years of dendrochronology records, plant and hydrological data, and results from permafrost studies. The GEF studies suggest significant climatic and vegetational effects from overgrazing and global change. The growing season now begins almost one month earlier than a decade ago, and there has been an increase in the total ecosystem water loss with no significant increase in precipitation over the last 43 years. Grazing has reduced overall plant biomass and the representation of grasses and plant litter in the steppe, and this has affected the system's tolerance to rising temperatures. Permafrost is beginning to thaw, and the active layer thaw depths have increased from 1.5 meters in the ungrazed southern valleys to over 4 meters in grazed areas. Permafrost loss will have a major impact on soil moisture and is likely to accelerate rates of decomposition and soil respiration, releasing more CO2.